It was at the Explorers Club in New York that Amos Burg -- National Geographic writer, lecturer, and photographer -- hatched his ambitious plan to voyage the coastal waters of Chile and Argentina in the fall of 1933. His two-fold intention: to photograph the indigenous tribes of the area for the national magazine and to follow in the historical wake of the Beagle, the ship that had carried Charles Darwin through the Tierra del Fuego archipelago in 1834, 100 years before. Burg's most immediate task was to find a boat worthy of such a challenging voyage. Burg's search led him to his home state of Oregon. In Coos Bay on the central Oregon coast, he purchased an aging 26-foot, self bailing Beebe-McClellan surfboat at auction for $40. Built in 1905 in Greenport, Rhode Island for the United States Lifesaving Service, the oar-propelled boat had served, and then outlived, its purpose. Burg had the boat shipped to Superior Boatbuilding Company on the Willamette River in Portland to be refitted. Modifications included decking, a larger mast, rowing hardware, modification of the hull for a centerboard, and the construction of an inboard motor well for a thirty-five pound, four horsepower Evinrude. By August 1933 the boat was finished. Burg named it "Dorjun", after the two Fleischmann children -- Dorette and Junior -- whose parents he had befriended on the round-the-world voyage aboard their luxury yacht Camargo three years earlier. Burg and the Dorjun departed San Francisco aboard the freighter SS West Mahwah on September 21, 1933 bound for Magallanes (present day Punta Arenas), Chile. Burg and apprentice seaman Roy Pepper spent the next three months voyaging through the archipelago as far as Cape Horn. In May 1934 the Dorjun (and Roy Pepper) were shipped back to Portland aboard the West Mahwah. (Burg's account of the voyage would appear in the December 1937 issue of National Geographic). The summer and fall of 1936 saw Burg and Pepper aboard the Dorjun voyaging the Inside Passage from Seattle to Skagway. By now Burg was travelling the world on assignment for National Geographic and various educational film companies. After the Inside Passage voyage and throughout World War II the Dorjun remained moored at Gaults Harbor on the Columbia River outside of Portland. Burg was overseas when the Memorial Day Flood of 1948 struck Vanport, a public housing project outside of Portland. The Dorjun was loosed from its anchorage at Gualts Harbor and swept onto a nearby mudflat where it lay abandoned for nearly two years. In 1950 Burg and his childhood friend Andrew Yunker retrieved the boat and hauled it to Yunker's home in Oak Grove. In 1958 Burg sold the Dorjun to Yunker for one dollar. Much to the dismay of Yunker's wife, the Dorjun remained in their yard for decades while her husband, a dentist and armchair sailor, tinkered with it. In 1988 Yunker sold the Dorjun to his son-in-law, Bruce Garman, for one dollar. 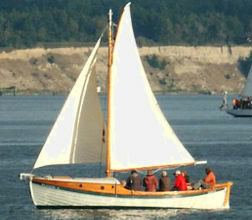 Four years later Bruce and his wife Virginia brought the Dorjun to Louchards Boat Shop in Port Townsend, Washington for restoration. On September 13, 1992 the Dorjun was launched at the Wooden Boat Festival. Restored again at the Northwest Maritime Center boat shop and relaunched in 2007, Dorjun continues to serve as an educational and training vessel for youth.